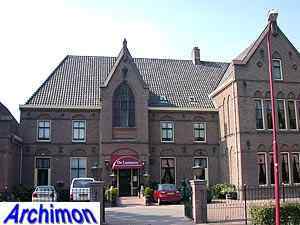 Nieuwegein was founded in 1971, when the villages of Jutphaas and Vreeswijk were merged to a new municipality. A new centre was built in between the two former villages, close to where in the Middle Ages the town of Gein had been. The reformed church of Jutphaas is a one-aisled building in neo-Classical style. It was built in 1818-1820 as a replacement for a medieval church which had been standing elsewhere in the village until 1819. 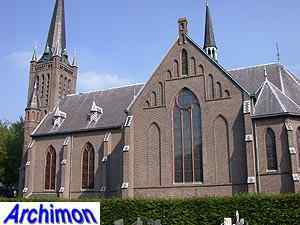 Despite the fact that they formed the majority of the population in Jutphaas, the Roman Catholics did notre gain possesion of the old church. Instead they continued to use a hidden church, until a new church was built in 1874-1875. 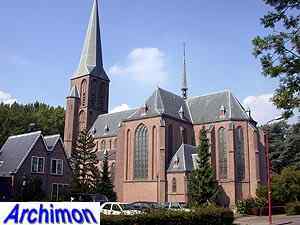 This neo-Gothic St. Nicolaas is an important early work by architect A. Tepe. 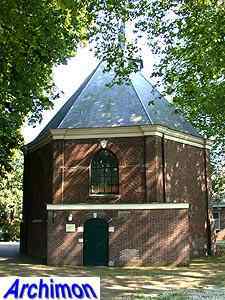 Tepe was probably also the architect of the Francois Heytink-Baesjoustichting, a Roman Catholic complex consisting of a convent with seperate schools for boys and girls on both of its sides. 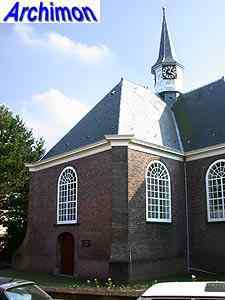 The medieval church of Vreeswijk had been destroyed by Spanish troops in 1585, after which it had been replaced by a new protestant church in 1638. This church was destroyed by the French in the 1670's and was replaced by the current reformed church in 1682. This church has a ground-plan in the shape of a Greek cross and is in Classical style. Like Jutphaas Vreeswijk had remained largely catholic. However, a catholic church wasn't built until 1806. That church was replaced by the current St. Barbara. This neo-Gothic church was built in 1908-1910 after a design by architect H. Kroes.